With a few odds and ends and a trip to the hardware store, you can help feral cats survive the worst that winter can offer. 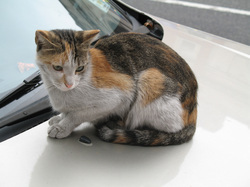 Even though feral cats develop a thick coat in the fall to keep them warm, they can die from exposure if at least some protection from the elements is not available. Elevating cat shelters and angling the front of the box can easily increase protection from wind and blowing snow. Don't forget to clear a path so the cats can come and go and check your shelters regularly. Alley Cat Allies recommends that shelters be at least 2 or 3 feet long and 18 inches high. The opening should be small enough to prevent larger animals from entering. A flat or L-shaped entryway will keep cold air from blowing in. Bigger shelters aren't necessarily better. Body heat generated by huddling cats tends to disperse, leaving the interior of the shelter as cold as the weather outside. Shelters can be made of wood or other materials, and they don't need to be fancy. Two inch thick home insulation boards come in large sheets at home supply stores. Sealing the edges with silicon caulking will prevent cold air from entering. Elevate the shelter on cinder blocks and place a flat piece of wood on top to weigh it down. You can make an 'instant' shelter from a cardboard box with a trash bag taped over it. Cardboard boxes from moving companies or ones in which computer equipment is packed make sturdy little dens and can be obtained for little or no cost. Tape a few boxes together to create a hallway and you have an 'instant' condo. Again elevate the boxes on bricks, blocks, or pallets. As long as a cat stays dry, she will survive the worst weather. A fast, inexpensive and functional shelter can be made with two storage bins and styrofoam insulation. Place a smaller storage bin inside a larger one, and stuff the insulation between the two. Cut an opening in the short side through both bins and the insulation for easy access. Turn the bins upside down, stuff with straw, and you have an instant shelter that will stay warm by keeping the cats' body heat from escaping. Use the power of the sun to keep your feral shelter warm and cozy. Solar pool covers are used to attract and retain heat from the sun to keep water in swimming pools warm. But you can use them as a way to upgrade your cat houses to solar energy! On a 10 degree Fahrenheit night the temperature inside could easily reach 70 degrees. Torn, but usable, pool covers can be found curbside on suburban garbage pick-up days. Purchased new, prices vary based on construction and thickness. A 15 mil premium grade 12 foot round cover costs about $32. You can cut them with standard household scissors. Drape one end over your feral cat house, silver side down, and the purring will start. Aim for full southern exposure. Check the temperature often until you know how much heat is generated; it may actually become too hot inside on milder days! Consider setting up a solar-warmed feeding station a distance from the sleeping areas. Consider surrounding your cats' shelter with bales of stray. Did you know that straw is a fabulously efficient insulator? Homes insulated with 18 inch wide bales of straw could save 75% on heating and cooling costs. Just think what that could do for your cats! Which brings us to bedding: Alley Cat Allies recommends using hard wood shavings or straw for bedding. Don't use towels for bedding since they retain moisture. Bed sheets cut from Mylar, the material used in emergency 'Space Blankets', retain body heat and can be found in the home or outdoor/camping sections of department stores. This material is easily cut to size. Feeding in winter also becomes a challenge. Food and water need to be protects from the elements. A stand with a sloping roof, open on two sides and elevated off the ground, would let several cats eat together. Fresh food and water at a consistent time every day is especially important during the winter. Ferals soon learn the time food arrives and will be waiting, even if they are hiding. Canned food, heated, is especially good but remember that it will freeze quickly if not eaten. Always leave dry food. Cats need extra calories in winter to maintain body heat, so expect to leave extra rations. Warm water brought to the feeding station will keep it drinkable for a while before it freezes. AVOID USING METAL BOWLS. You don't want your cat's tongue to freeze to the bowl. If you are lucky enough to have an electrical outlet near your feeding station, heated bowls are designed to keep water above freezing. If you place water or food bowls inside the heated bowls, you won't have to clean the heated bowls as often. To keep canned food from freezing, disposable hand warmers can be placed under the food or water bowls. Some of these tips, and more, are available from Alley Cat Allies. Common sense and a little ingenuity will keep your colony safe and warm during the winter season.